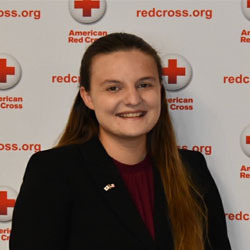 I oversee the volunteer experience for roughly 500 volunteers throughout South Dakota, North Dakota, and Northwest Minnesota for the American Red Cross. With 90% of our workforce being volunteers our team is constantly bringing in new volunteers, coaching supervisors, providing resources/trainings, and celebrating! I am responsible for strengthening and growing programs and services that will meet the regional community needs within resource constraints. This is accomplished through volunteer management, strategic planning, relationship management and community outreach. Like many people, I stumbled into it and fell in love! I was hired eight years ago in a part-time role while I was still in college; after graduation I knew there was nothing else I wanted to do than continue to explore volunteer management as a profession. To me MAVA means support. Even when I am living in a rural/remote area or across the country I know that I can turn to this support system for current resources and best practices to take on any challenge. Can you recall a time when being a MAVA member directly impacted your work in your organization? What were the outcomes of MAVA’s impact? Training is always needed and knowing that we have MAVA as a resource providing high quality courses has been instrumental in preparing Red Cross staff to lead volunteers. This allows us to improve volunteer management skills in our region which we have seen in turn improve our volunteer satisfaction scores, and we all know that life is so much easier with happy and engaged volunteers. It’s okay to not do it all. This profession tends to attract the most compassionate, humble, and passionate people in this world and our jobs will take as much as we are willing to give. I am HUGE on self-care and I have this saying plastered on my office door as a reminder to myself every morning as well as my team.